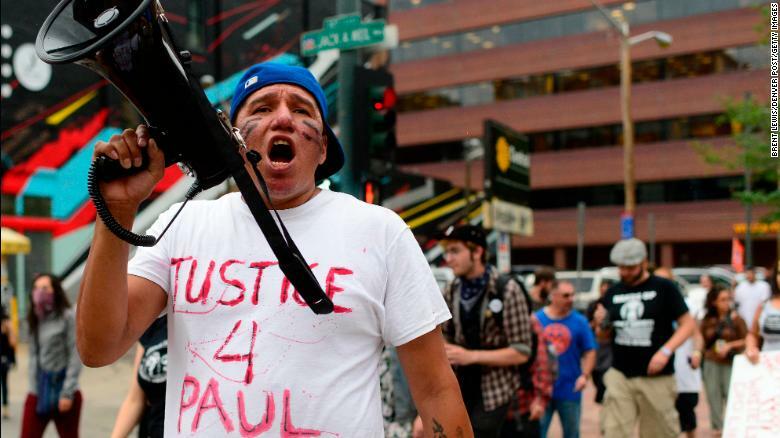 Protesters denounce the police-involved shooting of Native American Paul Castaway in Denver in 2015. (CNN) Allegations of excessive police use of force against African-Americans have captured the nation’s attention in recent years. But there’s another group whose stories you’re less likely to hear about. “Native American people are basically invisible to most of the people in the country,” said Daniel Sheehan, general counsel for the Lakota People’s Law Project. For every 1 million Native Americans, an average of 2.9 of them died annually from 1999 to 2015 as a result of a “legal intervention,” according to a CNN review of CDC data broken down by race. The vast majority of these deaths were police shootings. But a few were attributed to other causes, including manhandling. That mortality rate is 12% higher than for African-Americans and three times the rate of whites. Even though the annual rate of death is higher, the number of Native American deaths is relatively small. An estimated 22 Native Americans and Native Alaskans died at the hands of police in 2016, and another 18 have died so far this year, according to Fatal Encounters, an online database compiled by a former editor at the Reno News & Review in Nevada. It is widely considered one of the most complete sources on deaths resulting from police encounters. CNN excluded deaths caused by car crashes from Fatal Encounters’ tally. This count doesn’t include another fatal shooting on Wednesday. A sheriff’s deputy shot and killed 14-year-old Jason Pero on the Bad River Reservation in northern Wisconsin. A report by the Wisconsin Department of Justice said that Pero refused to drop a butcher knife and then lunged twice at the deputy. The state Department of Justice, which is continuing to investigate, said the boy himself called 911, giving his own physical description. The Associated Press reported that Pero’s family questions the police account and says the boy was home from school sick. “(There is) no reason you can justify shooting a 14-year-old boy,” Pero’s mother, Holly Gauthier, told WDIO-TV. Paul Castaway’s death in the summer of 2015 was one of those controversial shootings that moved his family to fight for wider attention to police violence against Native Americans. On July 12, 2015, Castaway’s mother called 911, breathless. “My son, he pulled a knife on me. He’s mentally ill and he’s drunk,” she said. Spurred to action by his brother’s death, Black Elk, a member of the Lakota Sioux tribe, created a Facebook message group for Native American families who have lost loved ones to police encounters. Slowly, the group expanded to include families of all races. “A lot of people told me, ‘I didn’t know this was a problem for Native Americans, too,’ ” he said. The data available likely do not capture all Native American deaths in police encounters due to people of mixed race and a relatively large homeless population that is “not on the grid,” said Matthew Fletcher, director of the Indigenous Law and Policy Center at Michigan State University. “The numbers might be wildly underreported,” he said. 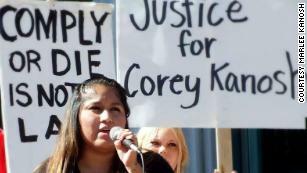 Marlee Kanosh says she has sought justice in her brother Corey’s death. Marlee Kanosh, too, lost a brother to police gunfire back in 2012. Corey Kanosh was the passenger in a police chase involving a drunken driver. When the car stopped, he fled police on foot and was shot while resisting arrest. The county attorney concluded that forensic evidence and dispatch logs supported the officer’s account of events, but his family complains that he was left overnight at the scene without medical care. Marlee Kanosh now runs a Facebook page called Native Lives Taken by Police to raise awareness of cases such as her brother’s. She said it can be hard to create — and sustain — attention for Native Americans’ cases, in part because many take place in small communities or more remote areas. “There are very few people who’ve heard about a story somewhere out in a small reservation in California, and I see a lot of families who deal with that,” she said. An analysis by Claremont Graduate University researchers recently published in the peer-reviewed journal Race and Justice found that major national or regional newspapers rarely picked up stories about Native American deaths. Even then, it found, the deaths rarely received in-depth coverage. What’s more, media don’t always correctly identify the deceased as Native American. His brother’s death was not the only link Black Elk had to police shootings. 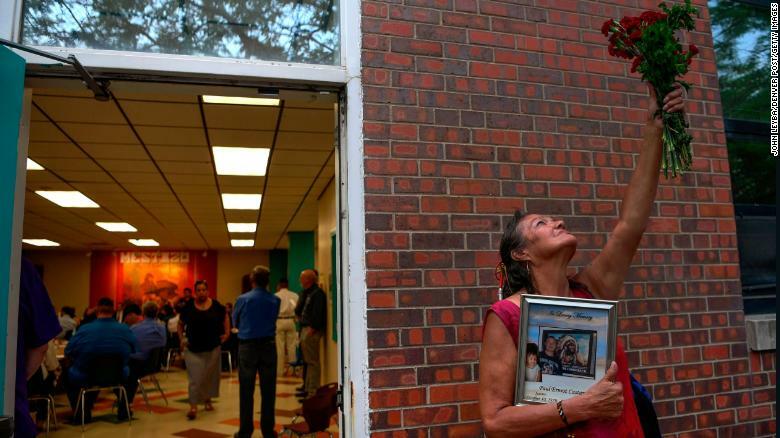 His mother’s nephew, Benjamin Whiteshield, was killed by police in Oklahoma in 2012. According to the Oklahoma State Bureau of Investigation, his family had brought him to the local police station because he had been “acting delusional.” Police said he was holding a wrench and was shot in the mouth after a confrontation with an officer. Then Black Elk’s cousin, Raymond Gassman, was killed in South Dakota less than a year after his brother died. He was shot by tribal police while resisting arrest. And in June, a member of Black Elk’s tribe, Zachary Bearheels, died after a violent encounter with police. “I heard him say ‘Mama, mama,'” she later told the Omaha World-Herald. She could tell from his voice that he was off his medications. The police department’s investigation found the officers’ use of the Taser an “egregious violation” of policy. “It has to do with a mental health crisis and with police killing Native Americans,” he said. The report found the agency was ineffective, lacked adequate oversight and put Native Americans’ health and safety at risk. “If your perception going into a situation is that it’s an Indian person and they’re completely out of control, I think that changes things on the ground,” he said. “And that would set the bar for future years for cops to always assume that when they were dealing with Native Americans it’s going to be because they’re drunk and going to get in fights,” she said. “But the flip side of that from an enforcement perspective is police have a job to do, and if it’s a polarizing situation leading to a deadly force situation, you don’t really have time to consider the cultural aspects of it. You have to take action, whatever that might be,” said Rex Scism, president and CEO of Midwest Police Consultants. “I’m not going to say the police always get it right; they’re human just like everybody else,” he said. She then turns back toward one of the officers, with the scissors in her hand pointed down. The officer shoots her four times: twice in the front and twice in the back as she crumples to the ground, according to the Maricopa County Attorney’s Office. The Department of Justice was called in to examine the police investigation of the case. Prosecutors concluded they could not prove beyond a reasonable doubt that the officer willfully used excessive force, said Devin O’Malley of the DOJ’s Office of Public Affairs. A few of these violent encounters have provoked wrongful death lawsuits or, in Bearheels’ case, assault charges. Yet most don’t. Kanosh said she and her family tried for years to bring her brother’s case to court, but in the end, they were unable to raise the money for an attorney. ← Why Are So Many Native Americans Killed By Police?